Reach Paradise: Jesus and the Dog? Bible passages usually bring out two separate sides of me. The first is that of a Catholic looking for the religious lesson buried (sometimes not so deep) within the stories and parables. The second is that of a curious “historian” who loves to think about what actually happened. Today’s gospel reading - Matthew 15:21-28 - is a perfect example of such a passage. The religious lesson in here is pretty straightforward. Our faith in Jesus will save us. And that faith should be as persistent as the Canaanite woman’s was. But boy would the “historian” side of me sure like to know what was really said and why. After all, read literally, Jesus is calling this woman or her daughter a dog. (I think the actual translation can range from puppy to dog … but still, its not that flattering!) And this is after ignoring her! So was Jesus really ignoring her? Did he really mean what he said - that he was only there to save the sheep Israel? Did he really think of the gentiles as “dogs”? Perhaps Jesus had a full day at that point. Maybe he was tired of the hundreds of people that surely clamored around him every day asking him to heal them. Its not unthinkable right? Or maybe the witnesses misread Jesus. 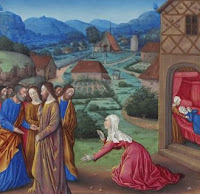 After all, the disciples ask Jesus to send her away so perhaps they misplaced their own feelings on Jesus? While both scenarios are certainly possible, I like to believe Jesus was simply teaching his apostles a lesson while testing the faith of this woman. After all, its hard to tell the tone that something was said when all we have is the written word. (Kind of reminds me of the problems we run into today with email being misunderstood or taken the wrong way) Maybe Jesus was not mocking the woman when he uttered those words … perhaps he was mocking society at the time. You know, with a sarcastic tone. Or perhaps he said them with a straight face to see how much faith this woman really had. In any case, the real lesson is clear and that is all that is important. Jesus will reward our faith in him. But I would sure like to have been the proverbial fly on the wall!